Oh that looks so peaceful! I am so ready for summer! Me too, Michelle! We finally hit warm weather. So happy! Yeah, I don’t think you’d want to take a bath here. Unless you don’t mind cold baths! Looks are deceiving. This is actually saltwater and very close to the ocean. thedoseofreality recently posted..Would You Rather: Watch Seinfeld Or Friends? I can get lost in your picture, it has such a calming effect. Vacation time! I’d love to be sitting there right now. It’s the view at a friend’s cottage. She invited me and a few other entrepreneurs over to work there last Friday. It was great! So lovely but I bet that water is COLD! Yep, that is one peaceful capture, I’m loving summer here in MI too, it was a long winter! I agree. It’s about time we got some nice weather. Of course, it’s raining and cool as I type this. Hopefully we’ll have a warm summer! beautiful pic! looks peaceful and refreshingly cool! Thanks, Zabe. I took it on a 90 degree day, but it was so refreshing by the water. A cool breeze went along with that view. Can I just go there NOW??? Please? 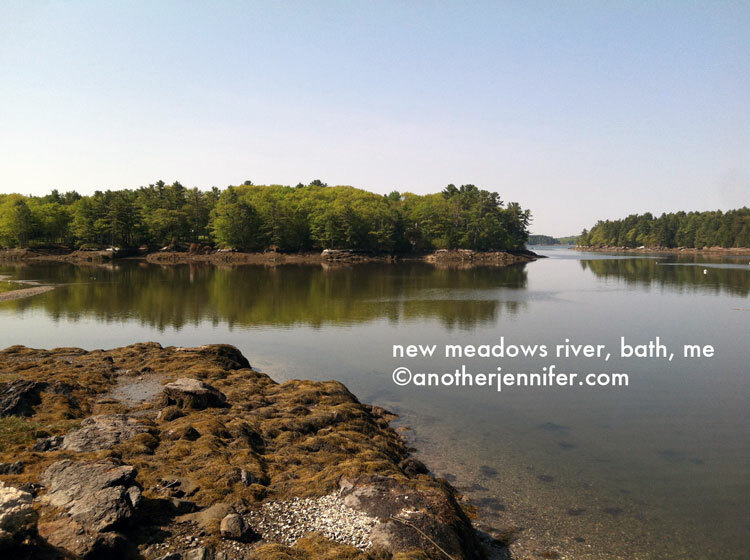 Oh take me away….New Meadow River!!!! anotherjennifer recently posted..Which nonprofits do you support? beautiful capture. love the reflection of bushes on the water! Thanks Ruchira. The funny thing is that the sun was so bright, I wasn’t sure what I was getting. I just snapped away and hoped for the best! WOW!! My husband is from Maine, and I HAVE to show him this! Such a beautiful shot!! That reflection is amazing! Thanks! I think I had great timing with the light. What part of Maine is your husband from? Beautiful! Wish I could be there soaking in this view right now. Thanks for visiting me at Doorkeeper. Blessings! I’m hoping to get back there soon! I was at my friend’s cottage working. This is why I endure the winters of Maine! Like Chris said above, can we just go there NOW??? Like I said to Chris, it is my intention to get you all up here soon! Love the picture! I want to visit! Betty Taylor recently posted..How can you lose 30 pounds?